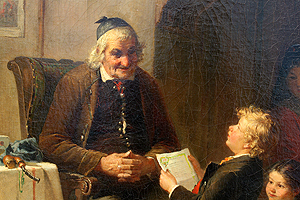 Friedrich Ortlieb (German, 1839-1909) A Fine and Large Oil on Canvas Titled "New Year's Day at The grandfather's". 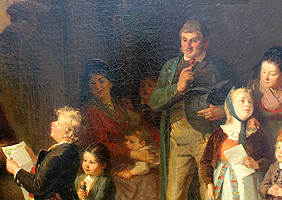 The joyful indoor family scene depicting a Christmas and new year's celebration with an elder seated couple, the grandparents, the grandmother holding a toddler on her arms, the grandfather with his smoking pipe by his side, both enjoying a young boy's (grandson) poem recital, while other children await their turn with gifts as the mesmerized young parents Stand and watch in awe. A Christmas tree by the window, a cat sneaking by and a basket with wine and bread awaits being delivered as a gift to the elders. 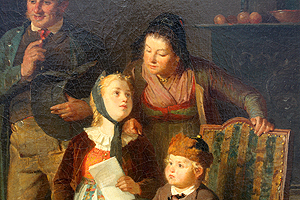 A young boy sits patiently on a chair, an apple and an umbrella by his side. 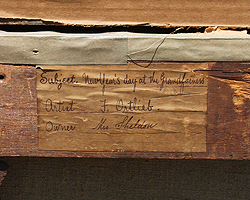 Signed: Fried Ortlieb, München 1873 - (lower right). 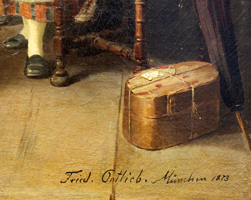 An engraved brass plaque reads "New Year's at the grandfathers - Friederich Ortlieb 1839-1909) Ciirca: Munich, 1873. Friedrich Ortlieb was an accomplished artist, born in Stuttgart in 1839 and died in Munich on the 4th October 1909. He received his formal art training at the L’Ecole des Beaux-Arts in Stuttgart and also at Steffeck, Berlin. 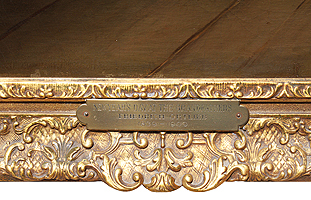 He exhibited widely, though most notably in Dresden and Vienna from 1871. He is best remembered for his genre scenes with children as shown in this finely detailed example of his work. Epitomizing the very best in this genre, Ortlieb depicts the character and personality of the children in joyful situations with accuracy and great sensitivity to the subject matter, a frozen moment in time with so much detail and emotion expressed in the children’s and elder's faces. RELATED LITERATURE: E. Benezit, Dictionnaire des Peintres, Sculpteurs, Dessinateurs et Graveurs by Gründ, Volume 8, Page 41. Friedrich Ortlieb (German, 1839-1909) A Fine and Large Oil on Canvas Titled "New Year's Day at The grandfather's". 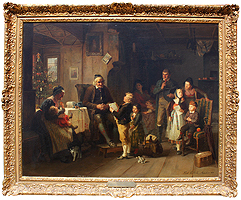 The joyful indoor family scene depicting a Christmas and new year's celebration with an elder seated couple, the grandparents, the grandmother holding a toddler on her arms, the grandfather with his smoking pipe by his side, both enjoying a young boy's (grandson) poem recital, while other children await their turn with gifts as the mesmerized young parents Stand and watch in awe. A Christmas tree by the window, a cat sneaking by and a basket with wine and bread awaits being delivered as a gift to the elders. 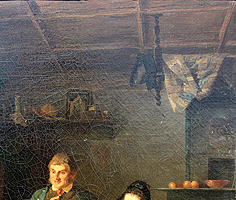 A young boy sits patiently on a chair, an apple and an umbrella by his side. 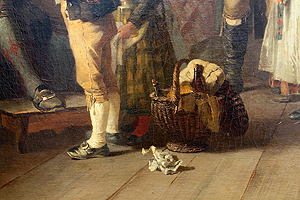 Signed: Fried Ortlieb, München 1873 - (lower right). 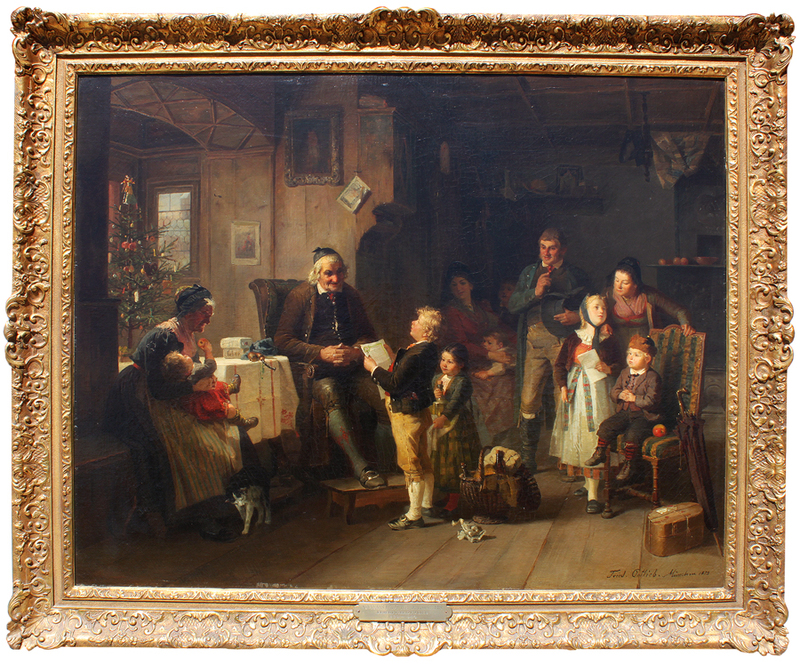 An engraved brass plaque reads "New Year's at the grandfathers - Friederich Ortlieb 1839-1909) Circa: Munich, 1873. Friedrich Ortlieb was an accomplished artist, born in Stuttgart in 1839 and died in Munich on the 4th October 1909. 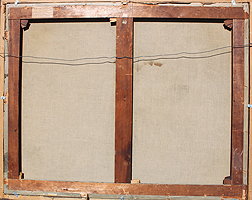 He received his formal art training at the L’Ecole des Beaux-Arts in Stuttgart and also at Steffeck, Berlin. He exhibited widely, though most notably in Dresden and Vienna from 1871. 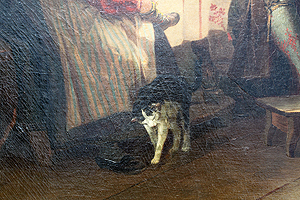 He is best remembered for his genre scenes with children as shown in this finely detailed example of his work. 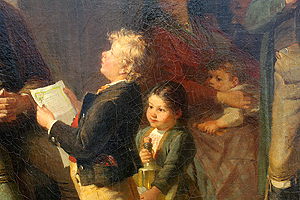 Epitomizing the very best in this genre, Ortlieb depicts the character and personality of the children in joyful situations with accuracy and great sensitivity to the subject matter, a frozen moment in time with so much detail and emotion expressed in the children’s and elder's faces.